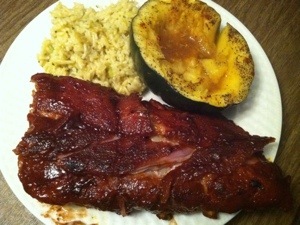 I’m absolutely obsessed with ribs right now. We had some at a friend’s home a few weeks ago. 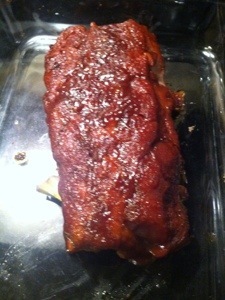 Then I made them for Father’s Day…then for dinner a week ago…and now I’m cooking them up again this Saturday. Besides being delicious, they are easy on the wallet. 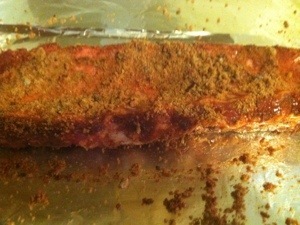 I just picked up pork ribs on sale for $1.99/lb. This recipe is so easy, anyone can do it. All you need is time. 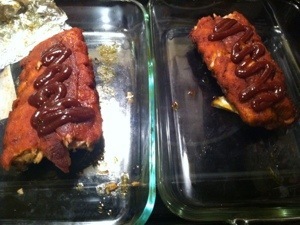 Also, I’ve made these with beef and pork ribs and they were delicious both ways. I’ve finished them on a charcoal grill (the best!) in the oven (the easiest! ), especially if it’s raining and you’re stuck indoors (like everyone in the Southeast). What’s your favorite meat to grill in the summertime? After three and a half hours, time for bbq sauce!